CADILLAC — About 15 to 20 riders are already taking advantage of a new program offered by the Cadillac-Wexford Transit Authority that should improve service for its customers. CWTA Executive Director Carrie Thompson and the CWTA hosted a ribbon-cutting ceremony on Monday for the new Night Rider program, which offers evening rides to Wexford County residents. Thompson said 15 to 20 riders requested rides for the service’s first day which was Monday. Most were using it to get to and from work, she said. Thompson recently informed the Wexford County Board of Commissioners that extended service times would begin on Nov. 28, and Monday’s open house and ribbon-cutting ceremony celebrated that milestone. The new service will be available until midnight Monday through Friday, and from 9 a.m. to 5 p.m. on Saturday. Thompson said the night service is part of the CWTA’s plan to improve services for riders. The plan was created after focus groups were held last year. The other parts of the plan include dependability, which is addressed with the CWTA’s new dispatch system, and more coverage in rural areas. “We have lifted all travel restrictions in our out-county areas, and they have been taking advantage of that all day (Monday),” she said. Thompson has said none of the CWTA’s millage money is going to be needed to fund this extended service time, thanks to a Job Access Reverse Commute grant through the Michigan Department of Transportation and Federal Transit Administration. The grant, about $160,000, covers the next six years. “We are really excited to deliver on the promise to the people of Wexford County to offer better service and more hours,” Thompson said. For more information about the program or to learn more about the CWTA, call (231) 775-9411 or log on to www.cwta.us. CADILLAC — The Cadillac-Wexford Transit Authority is kicking off a new era that should improve service for its customers. CWTA Executive Director Carrie Thompson recently informed the Wexford County Board of Commissioners that extended service times will begin on Nov. 28, and on Monday, the CWTA is hosting an open house and ribbon-cutting ceremony to celebrate that milestone. The event will be held at the CWTA offices, 951 Casa Road, with a ribbon-cutting at 4:30 p.m. and the open house continuing until 6 p.m. Light refreshments will be served. The new service will be available until midnight Monday through Friday, and from 9 a.m. to 5 p.m. on Saturday. The CWTA is calling the new service its Night Rider program. "We have been working on many items since our focus groups met about a year ago," Thompson said. "The three things the community wanted to see was more dependability, which we worked on with our new dispatch system; more service, which the extended hours addresses; and more coverage in our rural areas. Before, we had travel restrictions where we were out to places like Harrietta, Boon and the Mesick area at certain times. With the new dispatch system, (those customers) have access to buses all day long." Thompson has said none of the CWTA’s millage money is going to be needed to fund this extended service time thanks to funding from the Michigan Department of Transportation and Federal Transit Administration through a Job Access Reverse Commute grant. The grant, about $160,000, is for the next six years, and Thompson said it is attached to CWTA’s master agreement. Every six years, the CWTA composes a master agreement pledging to follow all MDOT rules in order to receive grants or any funding from MDOT. The grant funding is now attached to it, Thompson said. She also said CWTA has the ability each year to apply for different amounts, but it will typically be around $160,000. For more information about the program or to learn more about the CWTA call (231) 775-9411 or log on to www.cwta.us. If you work, study, or play late, we have good news. CWTA buses will soon be running weeknights and Saturdays. We listened to your input. We got the message. We made it happen. Our new Night Rider schedule beings in late November. Details will be announced soon. We'd appreciate any input you have regarding our Night Rider schedule. When you click the image below, you will be taken to a brief survey. CADILLAC — For the past few years, Elizabeth Boron has been taking weekly rides to the store, to appointments and other locations. Although the 60-year-old has her driver's license and a car to drive, she prefers to let someone else do it. She uses the Cadillac-Wexford Transit Authority. Recently, the authority has upgraded its dispatching service, the services it offers and its website. Boron said so far those services are working, but there also are some things that need to be adjusted. The CWTA had been working to introduce its new, fully automated system for ride scheduling called RideOnTime for the past several months. It initially went online in March but just recently had all the options made available to riders. CWTA Executive Director Carrie Thompson said focus groups of both riders and community members last fall were conducted to gather feedback before the new system was implemented. That feedback resulted in the identification of three things riders want: service to the out county areas such as Buckley, Mesick, Harrietta and Boon with no time restrictions; evening services; and Saturday service. Thompson said the hope is that the new efficiencies of the new dispatch system will allow for those three things to be implemented. How does the new system work? Thompson and CWTA Operations and IT Manager Aaron Stahl both said the system uses technology and automation to help drivers and dispatcher get to customers faster and more efficiently. To utilize the new system, riders call the same dispatch number — (231) 779-0123. A ride can be scheduled up to two weeks in advance or as late as the same day over the phone. Rides scheduled on the day it is needed, however, will not be guaranteed. The new dispatch system also allows for online bookings of rides, too. Those can be submitted to cwta.us. A ride can be scheduled up to two weeks or at least three hours in advance. Confirmation emails also will be sent after online booking is completed. Also with the new system, if a ride is scheduled at least a day in advance, the rider will receive an automated confirmation call the night before to confirm or cancel. A new feature of the system also allows for an automated call to happen just before the bus arrives to alert the rider of that fact. “This system allows us to track the buses better so we can give the passengers a better idea of what time they will be picked up," Stahl said. "We can track when a bus arrives at a location, when it departs, how long it was there, and how long it will take to get to the next location." He also said the new system allows for customers to take control of their ride by allowing them to track progress as well as alter or cancel it through the website. Agencies, Adult Foster Care or assisted living homes also can gain access and book rides for their customers. Before the new system was put in place, the only option for riders was to call, which they can still do. The difference is now when a call comes in, it is booked in the system and immediately sent out to a driver's tablet. The tablet allows the drivers to see all their calls, pick ups and drop offs. There also is navigation features for directions. If someone cancels, the tablet also shows that. In addition to being able to share all that information with drivers, the tablets allow dispatch to know exactly where their buses are or how fast they are going. They monitor everything, she said. Just like any new system, CWTA is working through the growing pains, and Boron understands that. She said so far, the only issues she has had with the new system is the calls alerting her that her ride is coming. Thompson said typically there are 400 to 600 riders per day. Buses travel a total of 50,000 miles a month. Typically, there are between 9,000 and 10,000 riders a month, and in May there were 9,482. She said there are 36 drivers, a total of 25 vehicles, and at any given time, there could be 18 to 20 buses out on calls. Thompson, however, said there aren't necessarily routes as rides are generated by need rather than a schedule. According to statistics generated by riders, a majority of CWTA users are adults between the ages 17 to 54, followed by senior citizens aged 55 and older. Students ages 5 to 16 were the next highest in ridership while youth ages 4 and under were last in ridership. For example, in February, adults made up roughly 45 percent, while senior citizens made up nearly 30 percent of riders. Stats for March were similar, and all statistics can be found on the CWTA website. Although there is the opinion CWTA doesn't have a lot of customers, Thompson said she knows that is not the case. She also reminds people the buses leave and return to Cadillac, so if you see an empty bus, it could either be on its way to or coming back from calls. “We know as transit we are serving a lot of people,” she said. 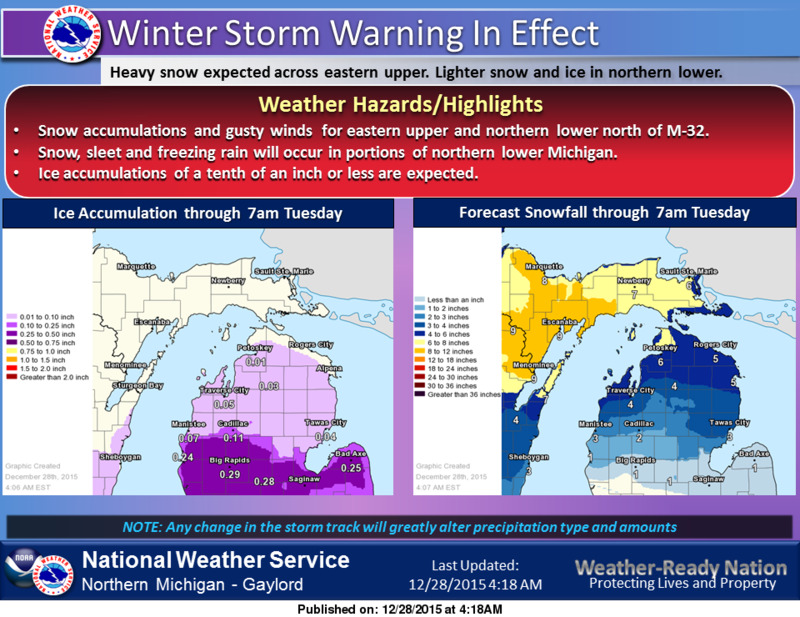 The National Weather Service has issued a Winter Storm Warning for Northern Michigan. Delays and cancellations are possible so please make sure you plan accordingly. We would recommend that you not plan to travel unless it is absolutely necessary. For the latest service information, you are also welcome to call our dispatch center at (231) 779-0123. A big thank you to our passengers and our community for your support over this past year; it's been a pleasure serving you! We have a bunch of great improvements planned for 2016 that we are looking forward to so make sure you check back for updates often. CWTA driver Jim, our Traverse City route driver, was given a tastey Christmas gift from one of his passengers for the great work that he does! Last week one of our great passengers presented our driver Jim with a tastey Christmas gift. We love our drivers too and would like to thank them for the service they provide. We couldn't do it without them! We will be open for regular service all other days. We hope you have a Merry Christmas and a Happy New Year! For those of you who have always asked for credit card processing, your day has come! Since the first of June, we having been testing Square for credit card processing and it has been working great! Come on in and you can now purchase all passes with your credit or debit card. This is just one of the many things we are working on to make using our service friendly, easy, and convenient to use. A public transit agency serving all of Wexford County.